Can we have vApp template? The answer is we can, but in a different way. To fully understand what’s happening, let’s look into vSphere API which will shed some insights about this. To most people’s surprise, vApp (VirtualApp) is a sub type of ResourcePool, not VirtualMachine although it behaves somewhat like a virtual machine in that you can power on and off a vApp as would a virtual machine. This is a good example in which knowing API gives you insights on how the system is constructed under the hook. That is why system administrators want to learn about API, especially object model, even though not developing code. Note that the first pool parameter is a required parameter and cannot be null as the second one. Given a vApp itself is a ResourcePool, you cannot remove its association with a ResourcePool object, or destroy itself. Now, how can we have a template for vApp? In fact, it’s pretty easy. You would use OVF as the template. From vSphere Client, you can get to the “Export OVF Template” dialog box, shown below, from File->Export->Export OVF Template. It allows you to export a vApp to your local machine in OVF. 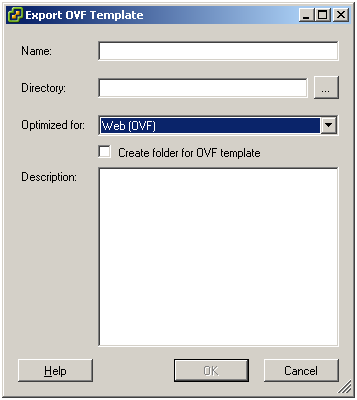 It’s also easy to deploy an OVF package to vApp with “Deploy OVF Template” dialog box as follows from File->Deploy OVF Template menu path. You can specify either from a local file or from a URL pointing to an OVF package. Unlike the other direction, you will have to go through several more steps here including accepting end user license agreement. You can of course export and deploy (import) OVF packages with vSphere API. Check out this blog for more details and samples. “Secret of vApp Template in vSphere | DoubleCloud.org” definitely causes me ponder a somewhat extra. I personally treasured every individual part of this post.